Luxury Maui Ocean & Golf View Villa! VIEWS!! $179+ Seasonal Pricing & Specials! Our villa has a MAGNIFICENT Ocean View at an INCREDIBLE price! Enjoy the breath-taking panoramic views from our single story Golf Villa in Kapalua. It is a spacious one bedroom condo (approx. 1,000 sq ft) with a huge deck (approx. 400 sq. ft) which is great for sunsets, outdoor dining and sunbathing. The villa is air conditioned and fully furnished, with a new Cal King-sized bed, large chaise couch, two full bathrooms, full size washer/dryer, two flat screen TVs and DVD with free Wi-Fi. Our villa also has a fully-equipped kitchen and one of 4 pools located close by. 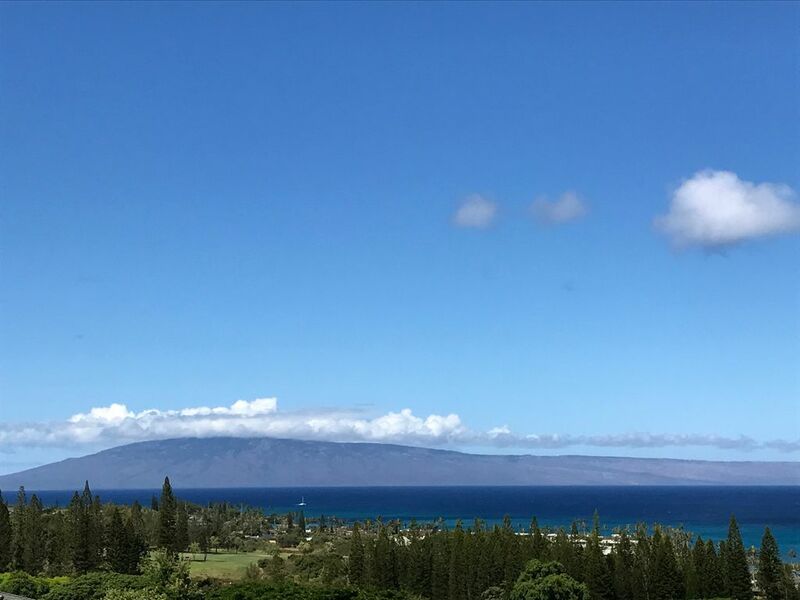 Enjoy spectacular sunsets, sweeping white water views of the ocean and Kapalua Bay Golf Course and an amazing view of the island of Lanai from your well-equipped deck/lanai. THERE ARE NO RESORT FEES OR PARKING FEES!!! Our villa is situated next to one of two world class Kapalua golf courses: The Kapalua Bay Course and The Plantation Course. Four of the world's top rated white sand beaches and several fabulous restaurants are just seconds away via FREE SHUTTLE or a nice stroll. We are very close to some of the best snorkeling on Maui!! Please feel free to read the reviews below. Many of the reviews are from guests who have returned every year to our villa for their vacation in paradise!!! Walk 10 minutes to the beach or take the free shuttle! The Montage Resort and The Ritz Carlton have fabulous restaurants and music and are just seconds away! The free Kapalua shuttle, exclusive to villa guests, provides service to these resorts! The complex is on the Kapalua Bay Golf Course and we have a nice view of both the golf course and the ocean! Gorgeous view of the whole island of Lanai and the ocean!! You can see the whales breach during the winter months! There is visitor parking nearby the unit. There is one designated covered parking space for this unit with additional guest parking very close by. There are outdoor grills by the four pools, one of which is just a few steps away! There is a very large deck/lanai with space enough for dining and sunbathing!! The lanai is one of the largest in the Golf Villas!! (4) There are four private pools at the Kapalua Golf Villas, one of which is seconds away from the villa! The views from our unit are amazing and everything is conveniently located close by. You can enjoy the serenity of our lush surroundings or stroll to the some of the prettiest beaches on the island!! The Honolua Store is not too far for a great cup of coffee or enjoy their deli and stock up on groceries or gifts. The Kapalua Bay Course is out our front door with the golf range nearby as well as hiking trails with breathtaking views. There is also a 3 hole walking course and putting green next to the range and resort stores! World class resorts, The Montage and The Ritz Carlton Hotel and Spa are only a few blocks away!! Enjoy their local musicians in the Hotel Lobby or dine at one of their wonderful restaurants. There is Paddleboarding at Kapalua and Napili Bay along with incredible snorkeling and Boogie Boarding!